Alexanders Fitted Kitchens Warrington designs, manufactures, supplies and installs beautiful luxury bespoke fitted kitchens from our Stockton Heath Showroom to the Cheshire area. Book your free kitchen design today and see how we can transform your kitchen and improve your lifestyle. At Alexanders Kitchens Warrington, Stockton Heath, every kitchen design is created and constructed individually for each client. No two kitchens are ever the same. Each kitchen design is unique to the room, the customers requirements and their lifestyle. By taking the time and understanding our Warrington customers preferences and priorities we ensure our work always achieves their desired outcome. The end result is a well designed bespoke fitted kitchen that is both efficient and truly beautiful. Browse our professionally designed kitchen collections for your initial inspiration. See how each can be tailored to your own requirements. 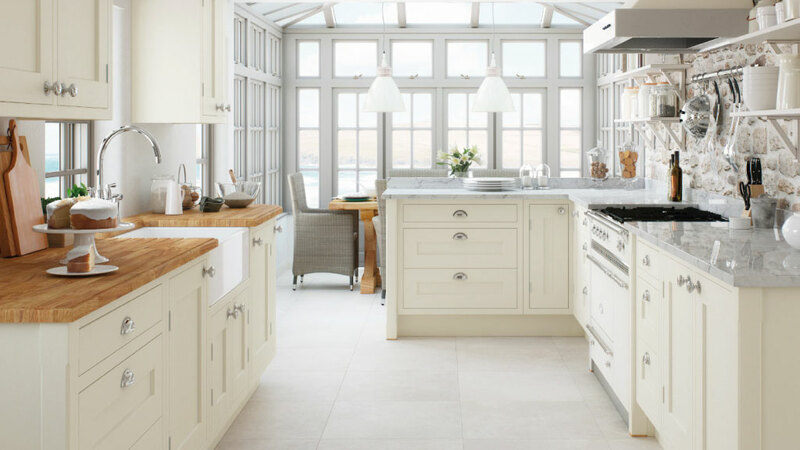 If you reside in the Cheshire area you could benefit from our free kitchen design service. Make an appointment or simply drop in to have a look, either way a friendly greeting awaits all of our Stockton Heath kitchens showroom visitors. Whether you want to browse quietly alone or take time to gain inspiration. Maybe you just have some questions that need answering. Our team will ensure to advise you professionally and honestly. 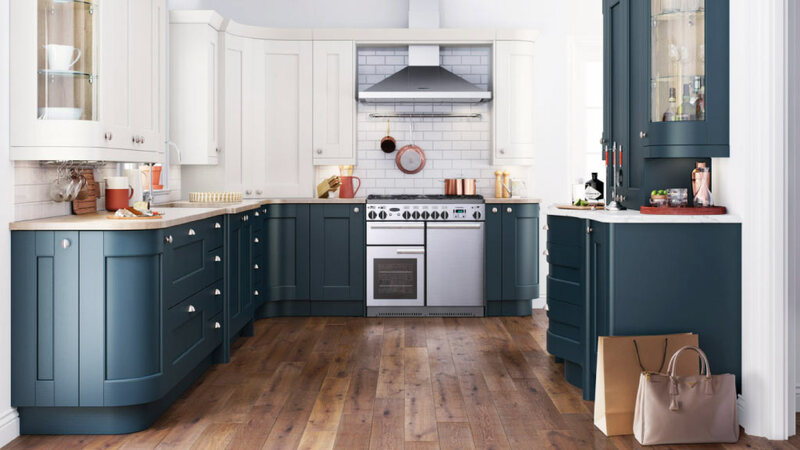 At the Warrington kitchen showroom we have a stunning painted in frame kitchen on display and a modern handleless kitchen display showing off both Classic, Tradititonal and modern kitchen styles. There is also a large selection of classic shaker kitchens available from painted solid wood to MDF painted shaker doors. We are extremely proud of the high standards of service and personal care that we extend to all our Warrington kitchen showroom visitors. We offer our free fitted kitchen design service in Warrington to further understand your requirements and get a feel for the possibilities within your room. Alternatively, if our Stockton Heath kitchen showroom location is not convenient for you to access, we will arrange for a professional fitted kitchen designer to come to you. In this way, you can ask any questions you may have regarding a new kitchen installation and view our range of high quality fitted kitchens. By discussing the project with a designer you will be able to explore the many kitchen design possibilities available to you in the comfort of your own home at no cost. The Alexanders ethos is to provide beautiful, functional, and aesthetically pleasing fitted kitchen designs, personally created to suit your home and lifestyle. In addition it always includes our uncompromising focus on quality. We use only the best materials, Kitchen Appliances, Granite worktops, Quartz worktops, Laminate worktops, Solid Wood Worktops and constructional quality. Our service standards are exemplary. Most importantly, we believe in building bespoke fitted kitchens that will perform to your highest expectations and will also stand the test of time. The Alexanders Kitchens Promise is to deliver your new fitted kitchen on time and within your chosen budget. We apply the same level of attention to detail and personal care to every element of our fitted kitchens and every project undertaken. This makes Alexanders Kitchens Warrington a unique place to be. Visit our luxury kitchen showroom in Warrington to see our quality craftsmanship. Discover the wealth of clever kitchen design features available to make your new fitted kitchen functional and truly unique. Together we will develop a bespoke fitted kitchen design specifically tailored to your desires and requirements. We offer an extensive range of painted kitchens in Warrington. 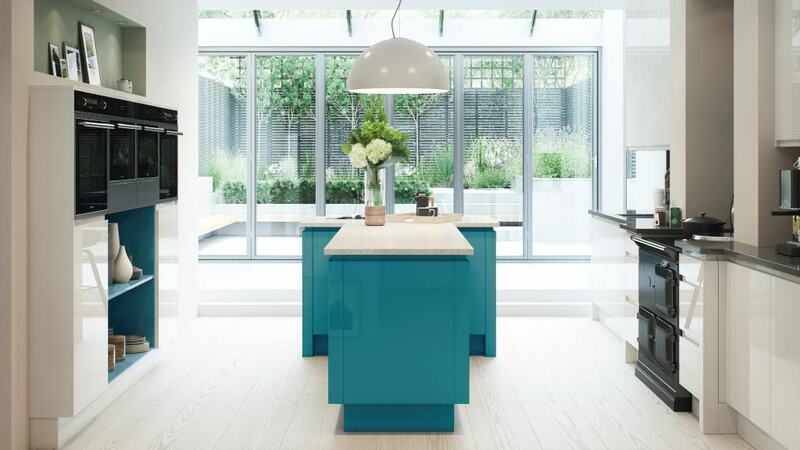 Our Painted kitchens are supplied in any of our bespoke painted kitchen colours. This offers great versatility and opens up hundreds of potential colour schemes. Create a classic look specific to your home with the painted kitchen selection. We supply high quality painted gloss kitchens in Warrington available in a wide range of colours. The modern choice for a stylish clean clutter free look. Choose from modern handleless kitchen door styles to flat slab door styles to achieve the look you prefer. The Shaker style kitchen has remained a popular choice. 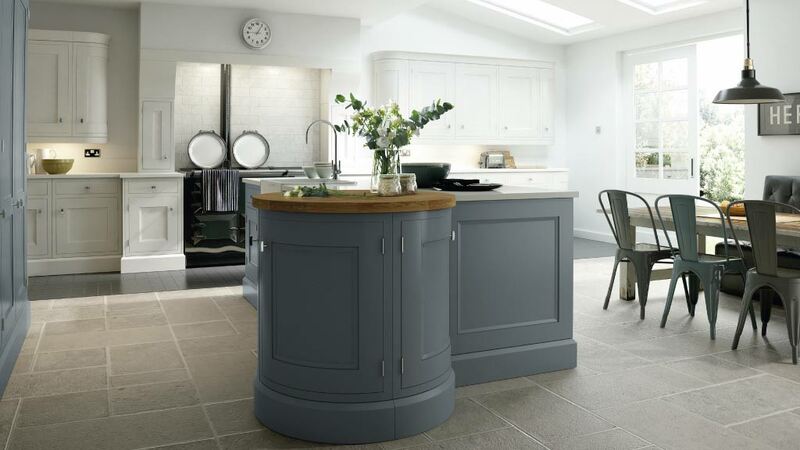 Call into our Warrington kitchen showroom to view our solid wood painted shaker kitchen doors. 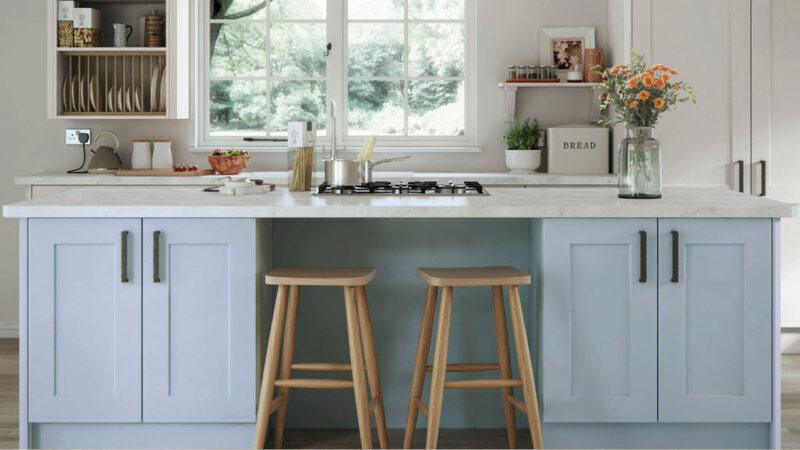 They can be painted in a huge selection of colours or if you want that traditional kitchen look they can remain sanded and lacquered revealing their natural solid wood grain. The kitchen has become so much more than a place to prepare food. As a result, regardless of size, it is now a central part of everybody’s home life. It can be your social gathering spot, the place to relax and enjoy a quick bite, or a quiet place to do a bit of work. It can also be a lively place for children to learn and enjoy. However you like to spend time in your fitted kitchen, we are here to make it happen for you. 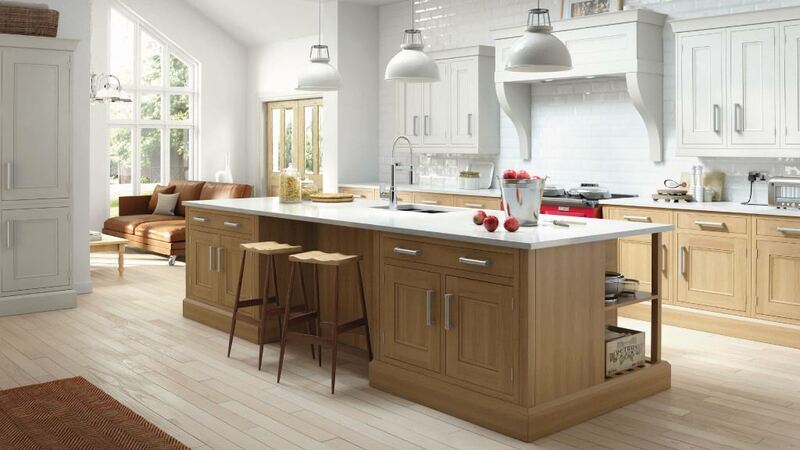 We are Warrington’s kitchen specialists. Our focus is solely on the creation of high quality fitted kitchens from kitchen planning and design through manufacturing to the fully fitted finished article. We are not confused by trying to supply bathrooms or bedrooms so you can be confident that our service is specific to our field. We are not distracted by other resource consuming product lines which ultimately reduce overall service quality and standards. Explore new ideas and benefit from our breadth of experience in fitted kitchen design. Discover the many possibilities available to you. We are meticulous in our service, we are passionate in our design, we are perfectionists in the quality of our installation. Most of all, we maintain professional standards throughout. On display we also have our new Smart Kitchen Range designed specifically to cater for low cost kitchen projects and people looking to save money with a cheap kitchen alternative utilising our high quality cabinetry. This kitchen range has been developed specifically to make a new high quality kitchen available at an affordable price. If you have a specific project in mind, together we will make it a reality. What else is inside our Warrington Kitchen Showroom building? 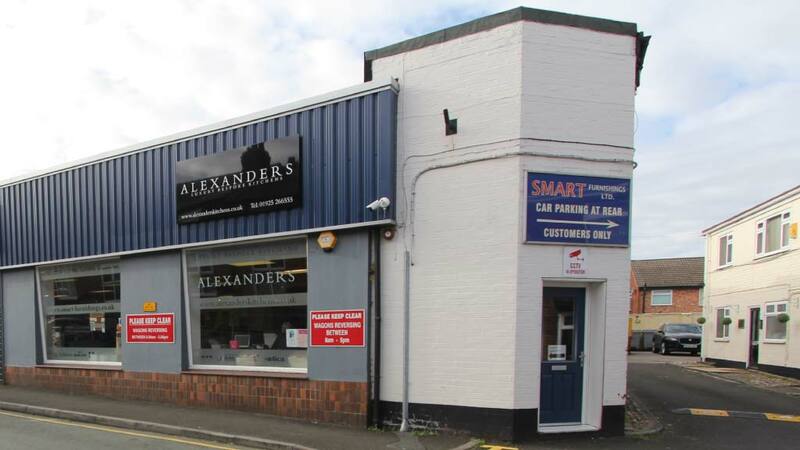 We share our Alexanders Kitchens Warrington showroom premise with three specialist companies. All of which are focused on providing high quality furniture products and services. When it comes to interior design in Warrington, colours and the overall look and feel of a room we utilise Pamela at Smart Interiors of Stockton Heath. Providing a wide range of fabrics and materials to cater for all interior design projects. Their products include blinds, textured curtains, feature wallpapers, tie backs and bespoke cushions. They even offer an upholstery service to bring new life to tired furniture. For luxury bathrooms and a wealth of product and bathroom design experience, the Smart Bathrooms Warrington showroom has a wide range of fitted bathrooms on display. Showing both modern and traditional showers, baths, taps, basins, mirrors and even tiles. Offering a free appointment service followed by a realistic plan and design where you can visualise your perfect bathroom layout. Alan and Roger tirelessly maintain their well deserved reputation as the local trusted bathroom specialists in the Warrington area. Finally, the Warrington Flooring and Furnishing Specialists Smart Furnishings. Well known and well respected as the place to go if you want excellent customer service. Their professional advice and experience regarding all types of flooring is extremely helpful. A huge selection of wool carpets and synthetic carpets are on show. Various laminate and solid wood flooring is available to view at the Stockton Heath showroom downstairs. Upstairs there is an impressive selection of high quality furniture. From sofa’s, recliners and chairs to occasional furniture, bedroom furniture and dining room furniture. They also have a wide selection of high quality beds and mattresses on show to test. This makes this building unique and a great one stop shop for all home furniture requirements. Well worth a visit if only for a browse.